Irish runner Michael McKillop has landed a prestigious honour by being named the male athlete who best exemplified the spirit of the Paralympics at the Games in London. The Northern Irishman will pick up a gold medal for the award from the International Paralympic Committee at the Games closing ceremony on Sunday. McKillop, from Glengormley, tweeted he was "so proud" of his latest honour. 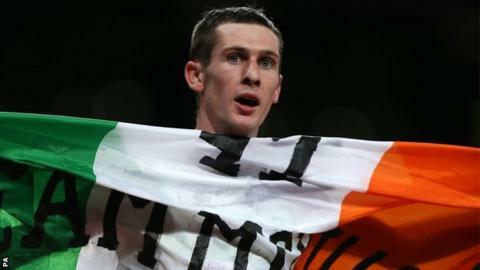 The Irish team member retained his T37 800m in London and also won the 1500m. A statement from the International Paralympic Committee said that McKillop had been selected as the Whang Youn Dai Achievement Award winner because of his work with schoolchildren in Ireland. The other contenders for the male award were South African star Oscar Pistorius and Egypt's Sherif Othman. McKillop's status within Paralympic sport was emphasised when his mother Catherine was asked to present his 1500m gold at the event's medal ceremony on Monday night. Kenya's Mary Nakhumicha Zakayo was named as the women's Whang Youn Dai Achievement Award winner. Zakayo, who competes in the F57 javelin and shot putt, was described by the award adjudicators as "helping to change the face of Paralympic sport in Africa". The awards are named after South Korean Dr Whang Youn Dai, who contributed her life for the development of Paralympic sport in Korea and around the world.